Towards the end of autumn I was keen to return to a location I haven’t photographed in a long time — Glenoe! 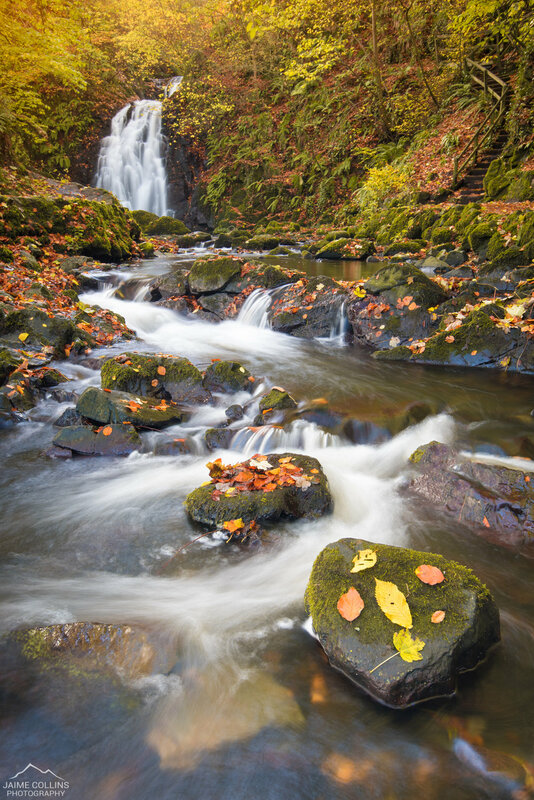 For those who haven’t been here before, Glenoe is nestled in the glens of Antrim and is home to a gorgeous waterfall. When I first visited this location many years ago I wasn’t nearly as adventurous, and opted to shoot from the safety of the path. Nowadays, I am not afraid of putting on my wellies and getting up close & personal with the compositional elements. Within a few minutes I heard the loudest of crashes, and turned to find Alistair completely submerged in the river, with nothing but his head and camera above water. Luckily, his gear was saved and we had a good laugh about it afterwards. It just goes to show that one can never be too careful in these situations… Especially photographers!